Since it was announced that Christina Aguilera and Cee Lo Green were returning to their positions as coaches on The Voice people were quick to predict that ratings would fall drastically after Shakira and Usher left. The Voice had its biggest premiere since the Super Bowl. The bitter housewives just got bitterer! The Voice season 5 premiere earned a 4.9 adults 18-49 rating, up from last fall's 4.2 and last spring's 4.8 adults 18-49 rating, and the highest Voice premiere premiere since the post-Super Bowl start of the second season on Feb. 5, 2012. Stay seething haters! The power of Legendtina! 'The Voice' has been adjusted up two tenths. 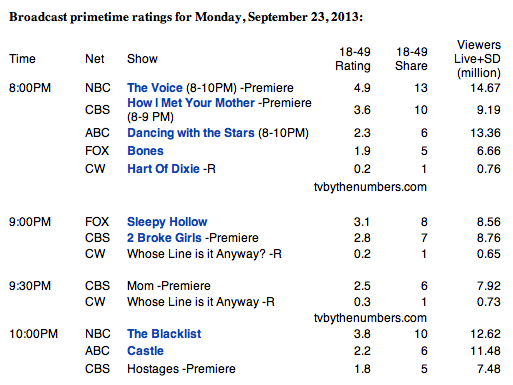 This boosts the 18-49 Rating to a 5.1 Demo, and amassing 15 Million Viewers Live.